Is government a contestable space? Yesterday in Revolution! (wait, what are we talking about? ), I essentially argued, among other things, that there may be harm in framing our social, economic, and political change efforts in the United States today in a term whose applicability may be historically contingent. The word revolution, I suggested, conjures the idea of overthrowing a government, and as such is descriptive of a particular model of transformation that only applies to the radical overhaul of particular kinds of oppressive governments, e.g. feudalism, monarchies, dictatorships, and colonial governments. The harm, I suggested, comes from the uncritical and unqualified dichotomization of revolution vs. reformism in some activist circles, where the former is exalted and the latter dissed. If we reject revolution vs. reformism as a false dichotomy and embrace that reforms (i.e. winning real improvements in real people’s lives now) are important, then another question arises: Is government a contestable space? If winning reforms is important, the practical consolidation will necessarily involve some kind of government action. And forcing some kind of government action will necessarily involve a contestation of the space within government (at least at the consolidation phase of the process). Now, let’s entertain for a minute that we decide that government is not a legitimate contestable space for genuine challenger movements. Then what is our theory of change? How will we improve the lives of real people (including our own lives), despite the powerful systemic obstacles in our way? I see two alternatives: we could 1) return to the arguably callous aforementioned “revolutionary” framework, where, in order to not legitimize “the system” or put a band-aid on a gaping wound, we postpone all social advancements until after the glorious moment of revolution (reminiscent of religious faith in a “reward in the hereafter”); or we could 2) adopt a voluntaristic “prefigurative politics” where we serve food in parks for free, squat community centers, organize bike collectives, plant community gardens, open free clinics, hold daily 4-hour General Assemblies, etc. — modeling the kind of nurturing, cooperative, anti-authoritarian world that we hold in our hearts. Or — score! — we don’t even have to choose between those two options: we can do both at the same time. And, in fact, I think that these two approaches, engaged simultaneously, constitute the basic modus operandi of many activists and activist groups today, especially explicitly anti-authoritarian groups. Don’t get me wrong. I think all that prefigurative stuff can be really beautiful and meaningful — and can indeed improve the lives of those participating and of people in the surrounding communities. But how do you scale it up? How do you extend the benefits beyond small, insular, often privileged social circles? By hoping that it will one day catch on and spread like prairie fire? And what about the state? Is the hope that it will just lose relevance over time and fade into oblivion? And, perhaps more importantly, what about Wall Street, the big banks, the hugely powerful transnational corporations? Is the idea that workers will one day organize, collectivize, and transform the whole mission of such institutions into a socially and ecologically sustainable one? Or that we’ll burn them down and build from scratch, under new emancipatory principles? Alternatively, government could regulate Wall Street, banks, and corporations starting now. Government could tax the rich and fund all those community-oriented spaces and programs, not to mention public education at the university level and universal health care. Government could significantly increase environmental and health regulations, and bolster enforcement. But government is in the pocket of the companies it’s supposed to be regulating! Politicians are bought and paid for by the highest bidder. The system is totally corrupt! Yes. So again I posit the question: Is government a contestable space? If not, why not? Because such a battle is un-winnable? 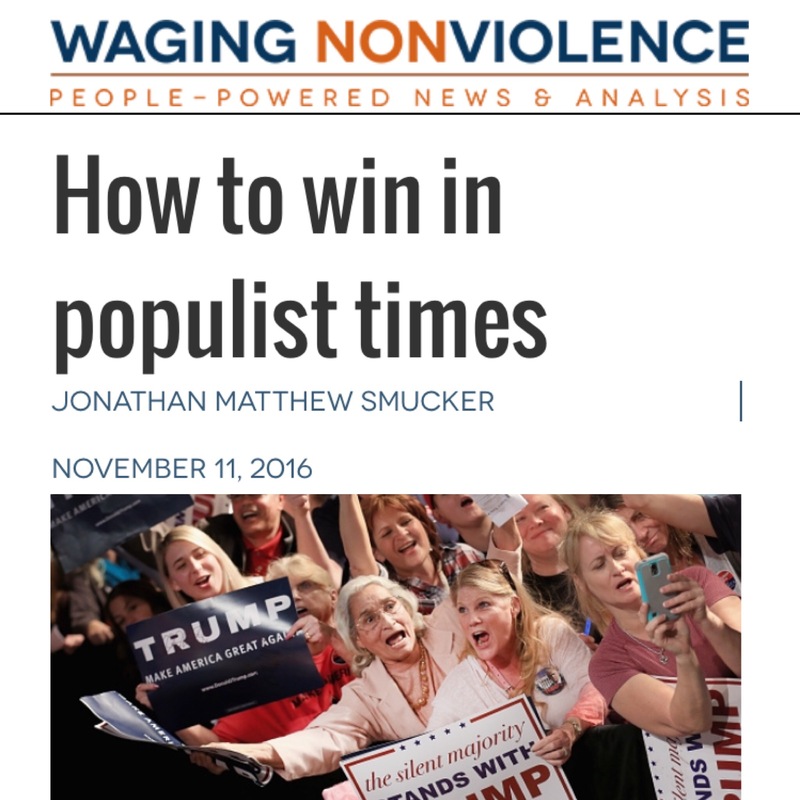 While the odds are certainly stacked against challengers, history is full of examples of challenger movements making political demands, organizing outside political pressure, engaging in hegemonic struggle, and finally consolidating their gains through the mechanism of government (local, state, and federal). This is true for almost all the major social and cultural gains won by movements in the United States in the past 100 years: workers’ rights, Civil Rights, women’s rights, gay rights, to name a few. Yes, all of these gains have been limited — yet meaningful and not nothing. And at least one of the lessons is crystal clear: to win these gains, you need a strong organized base applying pressure/power to counter the pressure/power of entrenched interests. But I think another lesson is pretty clear too: the mechanism of consolidation is ultimately government. In other words, the pressure must be based outside of the system, but it is ultimately pressure that is put on the system. Such pressure put on the system will be more effectively applied if that system is de-monolithized, its components mapped and charted — divided and conquered, if you prefer. Any struggle that has won anything worth a damn has had strategists doing this mapping, and ultimately, engaging in this contestation of the space of government. And any struggle that has won anything worth a damn has also had people who only engage in the arena of the streets, in the theatre of dramatically visible opposition. It’s fine to prefer the latter option. I certainly do. But pretending that the former role is unnecessary is, IMHO, a “revolutionary” worldview-serving delusion. It can be a harmless delusion, but it can also lead to attitudes and behavior that are quite harmful to the building, maintenance, and operation of an effective broader movement. And, as a general principle, the better we understand the full terrain of the war, the better equipped we will be to choose our battles and wage them strategically, in service of the broader effort. Well said. Part of the challenge is maintaining effective and meaningful modeling of the world we want to see while operating in the starkly different political landscapes where “wins” so often feel partial, short lived, or illusory. I’ve been part of campaigns that had tangible economic benefits for large groups of people, and that in some ways were exemplary of what democracy is really supposed to look like. The challenge is in expanding participation beyond those who already are committed to a radically different future. Because while participating in a truly democratic movement can galvanize and help transform people and even institutions, I would argue they have a very limited effect on the mindset of those who merely observe the change or benefit as free riders. Well said! Yes, the important other side of the argument I made above is that it’s also important to build a vision for a better world. Oscar Wilde said, “A map of the world that does not include Utopia is not worth even glancing at…” However, a vision for a better world that refuses to study and navigate reality as it presently exists is really little more than a hopeless dream. Your mention of wins being/feeling partial strikes me as an important detail. I don’t think there’s enough of an analysis about this perpetual reality. Without embracing gradualism and settling for piecemeal reforms, it is still important for organizers and movement participants to recognize that victories in social struggles are rarely clean, uncompromised, or total. Partly because we don’t recognize this, we are consequently unable to recognize — let alone affirm or celebrate — our victories. And when we don’t affirm our victories in our collective narrative (about our work for change), it becomes all the more easy to throw the very idea of working for reforms out the window. If such efforts seem to have never accomplished anything worthwhile, then such efforts can be dismissed entirely. Pingback: cooperative societies with state aid (#marxtheory) | Devoke the Apocalypse.